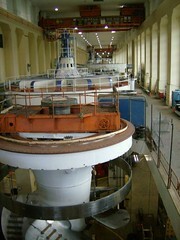 The Bonneville Dam fish hatchery is located adjacent to the Bonneville dam along the Columbia River in Oregon. Here, salmon, trout, steelhead and othe r species are hatched and raised and released to the wild where many will make the long trip into the ocean, then return to the Hatchery to spawn. It's actually hard to find (or take) a bad shot of the Oregon Coast, which is one of the most photogenic destinations you'll encounter no matter where you travel. Always after my trips to other places I come back to Oregon and never fail to note the abundant natural beauty of Oregon. After the batch of beer has gone through the 10-14 day fermentation process it's ready for bottling. 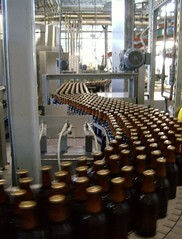 Here, a tube fills each bottle and caps them after which they are inspected and put in cases, and shipped out all over the Pacific Northwest. 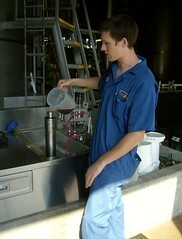 Some of the beer is kegged in a different machine for distribution to bars and restaurants. Full Sail Ale is one of the most popular beers in the Northwest, and our Full Sail brewery tour in Hood River helped us understand why Full Sail remains so popular. We had a great guide, Gary, and thanks to his expertise and the fact we were the only two on the tour we were able to ask a lot of questions. Gary explained that in 1985 the town of Hood River was suffering badly as the Timber Industry was in decline. 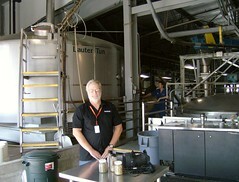 A group of friends, hard up for work, decided to start brewing beer and took over a small building which remains a small part of the huge brewery complex that now produces millions of bottles of Full Sail Ale and Henry Weinhard's as part of the Full Sail contract with Miller Brewing. Inside the Bonneville Dam Powerhouse water from the mighty Columbia River flows below, powering 8 massive turbines, each generating enough power for about 30,000 homes. Completed in 1937 after about 4 years of construction, the Bonneville project brought power, flood control, and jobs to the depression ravaged Pacific Northwest. Seventy years later the Bonneville complex has expanded to another powerhouse on the Washington side of the river, and continues on as one of the USA's major hydroelectric power resources. 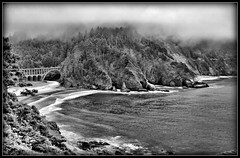 The Oregon Coast has no major cities but many small and charming towns and villages, almost all built around Highway 101 (the Pacific Coast Scenic Byway) and very near or along Oregon's beautiful coastline. You can find good detail on all these cities at the official website of the printed Oregon Coast Mile by Mile Guide and the companion Oregon Coast blog which provides travelers with details on things to do, where to stay, and where to eat all along the Oregon Coast's Highway 101. Bandon by the Sea is one of the cities along Oregon Coast's Highway 101 and a very popular vacation spot for California folks as well as Oregon locals from the inner valleys. 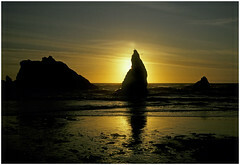 Bandon's actual official name is "Bandon by the Sea" but it is almost always called Bandon locally. Old Town is Bandon's charming downtown tourism district where you'll find several excellent restaurants shops, and lodging. A few miles south of town along the Bandon Loop Road are several more hotels like the Inn at Face Rock (nice rooms, golf, beach across the road) and the Windermere (right on the beach, more rustic rooms). Several years ago world class golf came to Bandon with the Bandon Dunes, a Scottish style course that attracts golfers from all over the world. Oregon's Tourism information office is called "Travel Oregon" and they have a lot of great resources available to you to help plan your Oregon trip. The best way to plan your trip to Oregon is to surf several websites, order printed information that many of those sites offer, and if you are like me keep cutting and pasting information into my own personalized trip guide. The official Oregon Travel website is Travel Oregon from the Oregon Tourism Commission click here for website . The Oregon Coast makes this job a little more interesting because there are literally dozens of excellent resources, many of which try to cover the entire coast. The most comprehensive of the Oregon Coast sites is the Mile by Mile Guide to the Oregon Coast combined with the Oregon Coast Travel blog. Both come from the publishers of Oregon Coast Magazine and the Mile by Mile Guide to the Oregon Coast which is the most popular guidebook in all of Oregon. Although I will cover some Oregon Coast themes here at The Oregon Experience, look to the Oregon Coast Travel blog for the best coverage of the coast including travel tips and news. Other good resources for the Oregon Coast are OCVA - The Oregon Coast Visitors Association new "People's Coast" website. Note: Please don't ask me to explain how in the world somebody came up with "The People's Coast" after spending a small fortune in consulting fees. OK, you talked me into it. Expensive firms routinely convince gullible clients that elite "branding" is more effective than real marketing. This is because real marketing has measurable results and returns on investment, where "branding" campaign failures can easily be covered up. Sorry - but this stuff bugs me. The most comprehensive directory to the Oregon Coast is this excellent Oregon Coast website that takes you mile by mile along the entire 363 miles of Oregon's magnificent coastline, from Astoria on the Northern Oregon Coast to Brookings on the Southern Oregon Coast. Here are the Oregon Coast Highway 101 mile by mile categories. Click on each for extensive details for each part of this amazing coastal drive - a drive I believe to be unsurpassed in charm and natural beauty. As we noted earlier, Highway 101 is pretty much the only game in town for travel along the Oregon Coast. When you are talking about travelling on the Oregon Coast, you are talking about Highway 101. US Highway 101 was designated a National Scenic Byway - the longest in the nation at over 300 miles, spanning the entire Oregon Coast from Brookings, Oregon north to Astoria, Oregon. The route is locally known as "101" but the Scenic Byway is called the Pacific Coast Scenic Byway NSB Website. This splendid drive offers many wonderful views though you'll want to get out of the car and hike the short distances that usually will get you to cliffs or the beachfront to see even more. One of my favorite hikes is the Indian Sands just north of Brookings in Harris Beach State Park. The area was frequented by Native Americans and is named for the colorful sandstone. Note that you can't get down to the water here - for that head south to Harris Beach Park Picnic Area. Also, there's a great Oregon State Welcome Center up the hill and across the highway from that Picnic Area. Brookings aka Brookings-Harbor thanks to a two city consolidation some time ago, is the Southernmost city on the Oregon Coast, in what locals call the "Banana belt" of Oregon thanks to the climate which is warmer than coastal points north in Oregon and south in California. Two great information stations are located in Brookings. 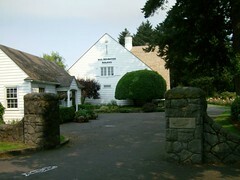 The first is one of several State of Oregon Visitor Information Centers where Oregon maintains an excellent visitor information center across from Harris Beach State Park just north of Brookings on Highway 101. In town in the Brookings Harbor Chamber of Commerce has an excellent collection of visitor information for Brookings-Harbor and it's located down at the Brookings Harbor, one of the areas you'll want to visit during your stay. Here at the harbor charming restaurants and shopping blend with working fishing boats. Sometimes you can even buy fresh fish right at the docks. Oregon Coast Visitors Association which promotes the entire Oregon coast. Travel Oregon, the state of Oregon's tourism website.